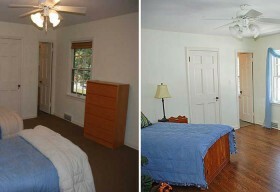 This home was on the market for six months by the time the seller contacted us. The home was vacant and was located on one of Shaker’s finest streets. The seller was at a complete loss as to why this fine home had no offers over the previous six months and why it hadn’t sold. 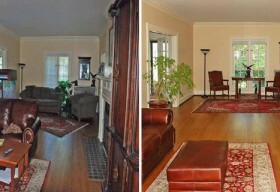 The seller both wanted to maximize their sales price as well as sell it quickly. Two major design flaws. 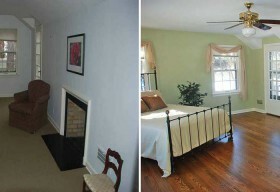 A) Master bedroom did not have a private master bath — it shared a full bath with an adjoining bedroom. 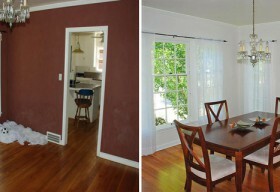 B) Kitchen remodel was a bad design — huge peninsula that impeded traffic in an awkward space. Kitchen also suffered from lack of natural light as it was very boxed off with only one small window. Tired/Dated. While this substantial, 1920s, brick and stone beauty was architecturally significant, this home has very dated bathrooms, and odd kitchen renovation, old carpeting, tons of wallpaper, funky colors, and a hodgepodge of elements that were at odds of the natural beauty of this fine home. 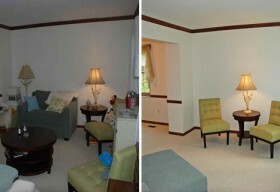 Home Staging. Since this home was vacant, with a smattering of random furniture spread out through this 3,500 square foot home, because of all three of these major category of issues, home staging as the final icing on the cake after the first two items were addressed would go a long way to showcasing the fine attributes this substantial home offers a discerning buyer. Master Bedroom-Master Bath Re-design. Create Two-Room Suite with Private Bath. 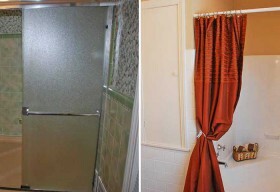 Create a true, private master bath for the master bedroom. Removed a 2nd entrance into the shared bath from adjoining bedroom #2. 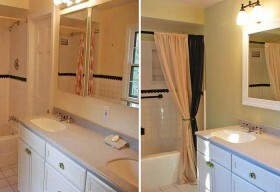 Minor cosmetic makeover of the master bath by framing an unframed mirror, painting, and a new light fixture. Bedroom #2 had back-to-back closets with a tiny bedroom #5 (way too small to be used as a bedroom by today’s standards) which had it’s own small private bath. Remove the back-to-back closets separating bedrooms #2 and #5 to create a two-room suite with a private bath. There was a linen closet in the hall that we created an opening into it from bedroom #2 so it could have it’s own closet. Problem solved. Master bath with more wall space for storage, and a a cool, new 2-room suite with it’s own private bath. 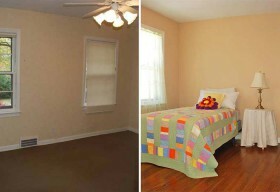 This change converted a 5-bedroom home into a 4-bedroom home — but this lack of an extra bedroom did not pose an issue as the old bedroom #5 was way too small. Kitchen. The layout of the cabinetry and counter tops was odd. We removed an awkward peninsula, moved some cabinetry around, created a pass-through opening from the breakfast room to allow natural light to stream in this dimly lit kitchen, and replaced buckled Pergo flooring in the kitchen and breakfast eating area with the same red oak flooring found throughout the remainder of the main level. Paint and a chair rail accent wall tied everything together. Design issue solved. Lack of natural light solved. Aesthetics issue solved. Dated Elements Updated. We did a cosmetic makeover of a jack-n-jill bath, removed/replaced old carpeting in the basement and stairs, refinished the worn hardwood floors on the upper level, removed wallpaper, painted, updated the finish on the banister, removed out-of-place, 70s, modern glass shelving in an old-world paneled wood library, updated numerous light fixtures and exterior tree trimming. 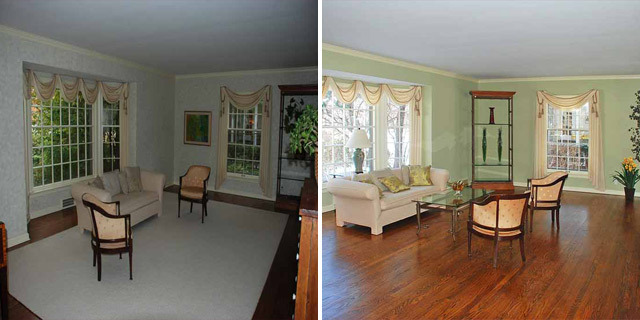 Home Staging. Brought new furniture and accessories in. Re-purposed existing furniture and accessories. Please visit our companion Shaker Heights Renovation Success Story to see the actual renovation, remodeling, re-design work done on this fine home. 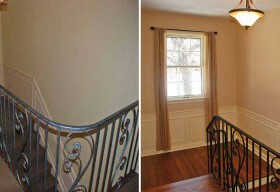 This post is the home staging portion of preparing this home for the market. 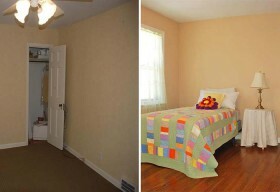 Note: The renovation costs totaled $19,941 for a combined total project cost of $22,356. 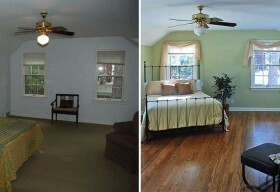 Positive Net Return on Investment (ROI) by choosing to renovate and home staging. “Chris walked into a challenging situation with my house. It had been on the market for 6 months, empty, and my husband and I had recently divorced. This was a nice large home on a lovely street, with a pool, and several other attractive homes for sale nearby. Utilizing his experience with demographics, market conditions, desires of new buyers, and experience in remodeling, Chris pulled it all together. 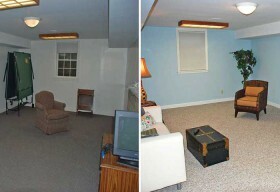 He got the house remodeled to a more desirable configuration, repainted and updated some of the older features and fixtures. Most of the work happened during the winter months, not the easiest time of year for contractors to get in and out. I was pleased and surprised when an offer came in early April, and delighted when the sale went thru in mid-May. Aside from his business experience and capabilities, Chris is a very pleasant person to work with. He is calm, low-key, prompt, and does what he says he will do in a timely manner. I always walked away from an encounter with him feeling well cared for, and that he knew what needed to be done.